2008 Ryder Cup pin flag autographed by captain Paul Azinger and the entire winning U.S. Team of 12 players: Chad Campbell, Stewart Cink, Ben Curtis, Jim Furyk, J.B. Holmes, Anthony Kim, Justin Leonard, Hunter Mahan, Phil Mickelson, Kenny Perry, Steve Stricker and Boo Weekley. 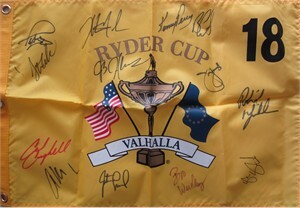 Obtained in person at various 2009 West Coast PGA Tour events. With certificate of authenticity from AutographsForSale.com. NOTE: THERE IS A STRAY PEN MARK TO THE LEFT OF CINK'S SIGNATURE. ONLY ONE LEFT.